Formulated with PhE-Resorcinol, an antioxidant complex (ellagic acid + Vichy Thermal Spa Water), exfoliant LHA and iridescent pearls. Immediately, skin feels smoother, suppler andmoisturized. In 4 weeks, skin texture looks refined, skin tone imperfections reduced. The exfoliating LHA helps remove dark dead cells loaded with melanin; skin starts to reveal its natural radiance and luminosity. In 8 weeks, significantly helps reduce the look of dark spots in color intensity. 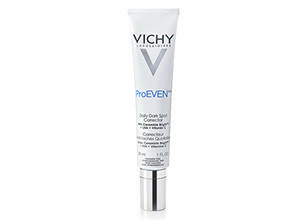 Vichy Spot Corrector – Yay Or Nay? It contains antioxidant complex that corrects appearance of dark spots and uneven skin tone leaving skin fresh and moisturised for 24 hours >> This promise made in a tube of 30ml. I have dark spot and uneven tone which are darker around my lips, especially in winter. The first thing I noticed is its watery thin feel and wondered if that is positive or not. It has a sweet smell that fades away after application. The tube is portable with a cap an easy handling. After first application, I noticed that a little went a long way; it covered both face and neck well. It is light and absorbs with excellence leaving skin with a lot of moisture and a youthful glow. After a few days, I excitedly noticed the spots were lighter and my face tone coming together. After a week, I entered confidence mode and stopped applying makeup foundation. I reasoned that as positive results were showing, I should allow it sole dominion on my face for it to work further (the cream can be used with other moisturizers /makeup). 3 weeks later, it is winning the dark spot battle. I am lighter in complexion with noticeable evened tone, even as I take photos under high light. For the first time in a while, I have been leaving the house without makeup! I will be continuing with this product definitely although I don’t like that the cap spills the product should an incident of squeezing the closed tube happen, and it is expensive given it is a high end product.